Some of the most enduring and popular memorabilia that exists to remind us of the amazing batting feats accomplished by members of the 700 Home Run Club® are the customized, game-used bats that have found their way into baseball lore. Following is a look at the actual bats chosen by many of baseball's greatest all-time home run hitters, members of the exclusive 700 Home Run Club(r) to pursue their dreams, along with details about the manufacturer/model/specs of each and "ballpark" figures of what you would have to pay to hold their preferred "tools of the trade" in your own hands. Editor's Note: The bat preferences of MLB greats who hit between 500-599 career home runs can be viewed by clicking here; 500 Home Run Club® Members' Tools of the Trade and the bat preferences of MLB's most elite sluggers, who hit more than 600 career home runs, can be viewed by clicking here; 600 Home Run Club® Members' Tools of the Trade. For details about the bat preferences of 800 Home Run Club® honorees Sadaharu Oh and Josh Gibson, click on; 800 Home Run Club® Honorary Members' Tools of the Trade. 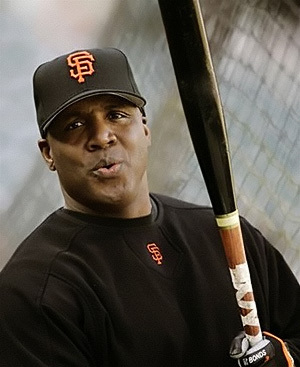 In addition to determining the outcome of many SF Giant games, each home run hit by Barry Bonds from 1998 to the end of his career shaped the future of the Canadian bat manufacturer that "shaped" his signature baseball bats - Holman's Original Maple Bat Corporation. According to Sam Holman, when his company was facing the possibility of bankruptcy in 1998, Bond called him worried about where he was going to get his bats. "I told him we were struggling to get new wood supplies," Holman said. "He gave us a check for $40,000 and just said, 'Go get some wood.'" 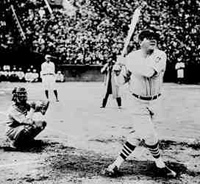 The money not only bought enough maple to make Bonds his bats -it bought Holman time to find three new local investors and keep his company alive. "He really stepped up to the plate," Holman said. "From our point of view, the biggest home run he has ever hit, he hit for us." 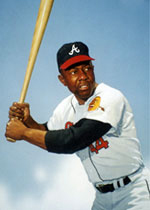 After hitting career home run #704 on August 18th, 1973 at Jarry Park in a game played against the Montreal Expos, Hank Aaron gave the bat he used to the fill-in Batboy for the Atlanta Braves that day - a lucky young man named Laurent Lacombe Jr. After cracking the authenticated (704) bat during his next at bat hitting a foul ball, Aaron had it set aside in a secure place in the dugout. After the game he was seen by numerous witnesses personally giving the bat to the youngster. Seen at a recent auction, the authenticated Hank Aaron "704 Home Run Bat" showed heavy ball marks and deeply embedded stitch marks, as well as bat rack markings and light cleat marks where Aaron tapped the bottom of his shoe during his at-bats. The Bat has a 6" long crack running through the Hillerich & Bradsby center brand stamping, which is consistent with the batboy's letter of authenticity.